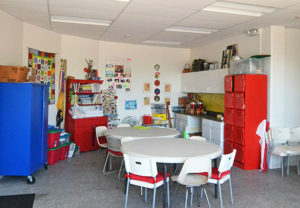 With a variety of supplies and mediums to choose from, this room offers something for people of all ages! From sewing or quilting, to crafting and collaging, this room has everything you need! If working on your own project, bring in your materials and enjoy working in a quiet, well-lit studio space. Can be available for parties and events by request. Contact the Community Center at 788-7683 for more information or to reserve this room. Art Classes offered throughout the summer! For more information, click here!